Barn window sign with landscaping still in progress. The small hill and entrance to the property as it stood in Oct 2010. We taped off the old window frame and then used double sided tape to attach cthe cut out numbers – we printed off the numbers on simple copy paper. Next step was to attach the finished window sign to two old oak posts from the barn – we just used simple rafter brackets. The “new” address sign at the front entrance. For now – we planted some grasses – later on we will add more stone and landscaping. Our little farm is actually easy to miss as you drive by the main road. Nestled down in a small valley – and surrounded by some other barns, a couple houses and open land – it’s pretty easy to drive right by the little hill of a driveway entrance that welcomes you in. Not to mention – all that marked it was a 3″ x 8″ high home made address marker that fell over more than it stood :). So a few weeks back – after someone coming to pick up a pergola drove by a few times before finding us – we decided we had to finally mark the entrance a little better. Of course we always want to try to keep with the recycle theme – so Mary came up with the idea to use one of the old windows we had sitting around out of Dad’s barn. It turned out to be a relatively easy project. Mary simply brushed off and roughly sanded the old wooden frame – and then added a few coats of exterior black paint. She left all of the details of the window – the little swinging lock at the top – and the thin little lift handle at the bottom. After that – she laid out and printed off some 8″ letters on our printer and cut them out – attached double sided tape and centered them on the window. After taping off the painted wooden frame and a couple of coats later of window frosting – and whalaaaa…instant unique address sign! To make the numbers stand out even more – she then outlined the numbers with a thin coat of black paint. To finish it off – we sunk in two of the old oak posts left over from the barn on either side -and then attached with brackets. I love pulling into the driveway in the early morning as the rising sun comes up behind the sign and lights up the numbers for all to see. 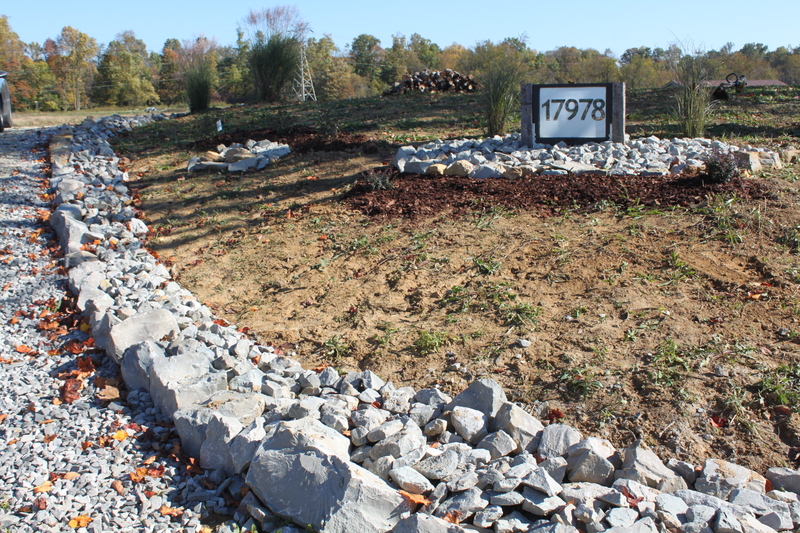 For now – we planted a few of the leftover grasses we had in the holding area – and then early next spring – we will finish off with rock and landscaping to create an inviting entrance for visitors to the farm.